Paul Thomas Anderson is one of our greatest active filmmakers, but Inherent Vice isn’t one of his great films. In typical Anderson fashion the film is an ambitious undertaking, though not in a way that’s akin to the visual and thematic scope of There Will Be Blood, or the vivid character mosaics of masterpieces Magnolia and Boogie Nights. The degree of difficulty here is in adapting Thomas Pynchon’s deliberately dense novel. 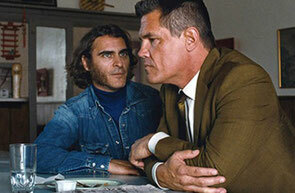 Using an omniscient observer to recite Pynchon prose and long scene after long scene of a stoner listening to other characters parse out information, Inherent Vice only occasionally engages with moments of absurd levity that get swallowed up in cold confusion. “Doc” Sportello (Joaquin Phoenix) is an unlicensed private investigator and marijuana enthusiast – the importance he places on those two duties aren’t necessarily in that order. The year is 1970 and one evening Doc comes out a drug-induced fog in his ramshackle Southern California beach pad to find ex-girlfriend Shasta Fey Hepworth (Katherine Waterston) standing at his threshold. She’s gotten mixed up with real estate tycoon Mickey Wolfmann (Eric Roberts) and is convinced that his wife is conspiring to lock Mickey up in a mental institution. The convoluted story isn’t presented as a straight-forward mystery; it’s a labyrinthine stroll through a counterculture facing sweeping changes. The new decade is a threat to Doc’s hippy-ish lifestyle, the Manson Family murders referenced more than once to call attention to a loss of free-love innocence. Wolfmann is leading a Southern California metamorphosis, with condo developments that sell a new American Dream. When Doc arrives at Golden Fang’s LA headquarters he finds a modern, talon-shaped building that’s been constructed on a vacant lot he and Shasta once visited in a quest for weed. The fangs of the complex story don’t dig deep enough, however. Anderson uses an unhurried pace to follow Doc on his journey. A series of long conversations become harder and harder to follow, perhaps purposely, but it’s almost impossible to stay engaged even on a superficial level in appreciation of the whacked out characters. Phoenix is very good as Doc though the character’s charms wane as the mystery stagnates. The twelfth time we see him high and attempting to follow what another person is saying isn’t nearly as enjoyable as the first or second. A few hilarious slapstick moments like Doc getting whacked in the head and comically flailing his arms, or writing notes to himself like “not hallucinating” and “something Spanish” just sort of evaporate into the ether of the sluggish story. Phoenix is also a great match for Brolin’s Bigfoot, a hulking threat that flaunts civil rights violations, but also dabbles as an actor and loves to munch on frozen bananas and Japanese pancakes. Phoenix’s quizzical looks at Brolin as he eats are great. Supporting turns from Waterston, Wilson, Jena Malone as Coy’s recovering addict wife, Reese Witherspoon as a friendly D.A, and Benicio del Toro as Doc’s lawyer are all solid, but do little to add inertia to Inherent Vice beyond their self-contained, sporadic appearances. By the time we get to a zany dentist played by Martin Short, a teen runaway with past ties to Doc, and loan shark Adrian Prussia, we’re a little too glazed over to care. Ethereal peculiarity in the form of all-seeing narrator Sortilège (Joanna Newsom), who also makes advisor-like appearances at certain points within the unfolding narrative, doesn’t add heft to the proceedings. As complex as Inherent Vice is – and well-acted, and well-made technically – it just doesn’t mesh into a satisfying experience. Maybe there’s a wavelength to pick up on during repeat viewings, but for the first time I’m in no hurry to re-visit a Paul Thomas Anderson film.